EL1 High Back Chair with Headrest, Inflatable Lumbar Support, Tempur Foam Backrest and Seat Cushion, with Seat Depth Extension and. This ergonomic chair has tension controlled movement with a multi lock seat tilt, together with backrest height and rake angle adjustment which allow the chair to be adjusted to the exact requirements of the user. The Tempur foam in the backrest and seat cushion allow the user to remain seated comfortably for prolonged periods of study/work, and the inflatable lumbar support can be adjusted to suit their needs. 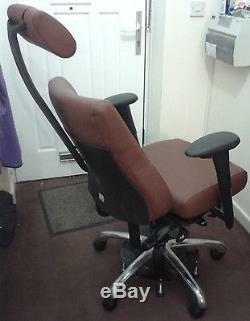 The chair is also fitted with. 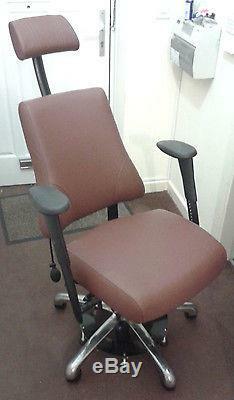 8N Adjustable armrests which are set back to allow close access to a desk. The seat depth is slightly extended to compensate for the Tempur foam in the backrest. The photos show some of the adjustments possible. The movement lock base allows the chair to be fixed in place when activated, by preventing the wheels from touching the ground fully. 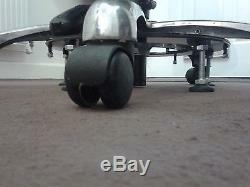 When not activated, the chair moves freely on wheels to allow re-positioning. This is controlled by a battery powered handset, which uses 4 AAA batteries. The photos show the base in both positions. This chair would especially suit someone who needs to work for long periods in comfort, or a person who suffers pain and needs freedom to adjust multiple features to remain comfortable while working or studying. The movement lock base is ideal for those with mobility issues who need the chair to remain in place rather than risk the wheels moving while transferring into/out of it, thereby reducing the risk of falls. This chair was brought to assist a wheelchair user who was studying, but it proved easier for me to stay in the wheelchair and so the chair has had minimal use. 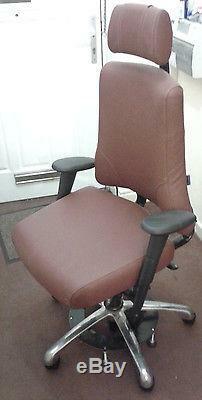 Apart from some dust from storage, the chair is clean and tidy with no damage to the leather seat and back. There is some minor cosmetic scratches on the plastic parts but it is in full working order. The chair can not be dismantled and is not boxed. Depth: 74cm, width: 75cm and height: 123cm. The item "Ergonomic genuine leather office desk chair (Tempur foam) with locking base" is in sale since Saturday, December 03, 2016. 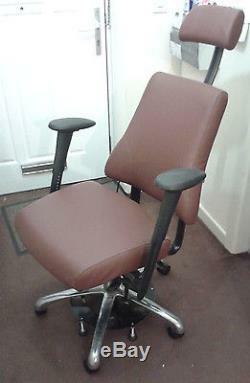 This item is in the category "Business, Office & Industrial\Office Equipment & Supplies\Office Furniture\Office Chairs".s" and is located in Rochdale. This item can't be shipped, the buyer must pick up the item.